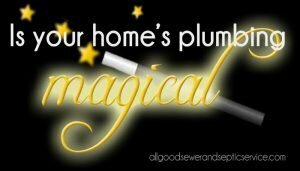 There seems to be a perception, by some, that plumbing in your home is magical…where once an item goes down the drain it vanishes, forever, never to be seen again…pure magic. That would be great, but it’s not true. Items that are disposed of down the drain, or in the toilet, take a journey through the pipes of your house into the septic tank. Things that do not break down can create blockages and cause serious issues. This can result in potentially costly damage to your septic system. Below is a list of items never to go down the drain.